I am a survivor of childhood trauma. I am also a therapist who works with men and women who are survivors of childhood trauma of all kinds. So what I will share in this article comes out of my personal recovery journey and is enriched by the stories of others who have allowed me the honor of sharing some part of their journey. What I will discuss here is one model for understanding the processes involved in recovery of this kind. This particular model focuses on the process of integration. We often think of healing as a journey toward wholeness. Moving toward wholeness involves gathering up all the fragmented pieces of our lives and of our selves and bringing them back together. Part of what happens in childhood trauma is that we instinctively do whatever we need to do to push away from the pain that is being inflicted on our developing sense of self. If we push away long enough and hard enough, we begin to disown parts of our experience and even parts of ourselves. Disowning our experience and ourselves includes anything from forgetting what happened, to knowing what happened but convincing ourselves that it wasn’t so bad or that it didn’t have any long-term impact. 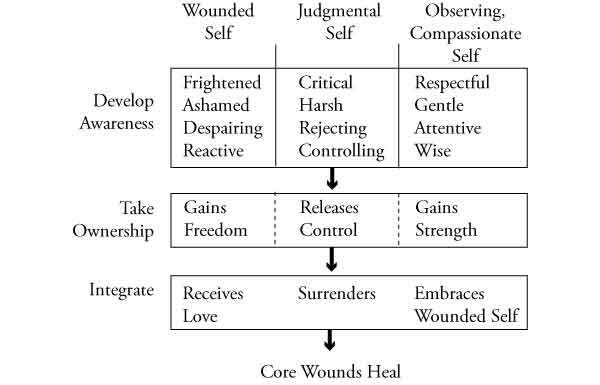 This model assumes that major unresolved trauma of any kind in childhood leaves us with internal states that are separated from each other and often in conflict with each other. In particular we will look at three internal states or senses of ourselves. These three internal selves include a wounded self, a judgmental self and an observing, compassionate self. Recovery from childhood trauma involves owning the experiences we have disowned. It includes owning parts of ourselves that we continue to want to push away. This is a painful process because it means that we will need to embrace painful realities. Everything in us (and often around us) tells us that this is not the right path to take. But it is always truth, no matter how painful, that frees us. Embracing our life experiences and their ongoing impact on us is the path to freedom and wholeness. The wounded self is the part of us that carries most of the shame, fear and despair that were generated at the time(s) of the trauma we experienced. Children have a very limited perspective on events in their lives and most often interpret any negative experience as their fault and as evidence that there is something wrong with them. Because we are talking about trauma that occured in childhood, we often experience this wounded part of ourselves as a child self. This part of us will usually have the mindset of a child about the age we were when we were traumatized. So this part of us may be three years old or thirteen years old. Or, if we experienced ongoing abuse or trauma, we may experience this part of us as being at different ages and stages of development. Before we begin our recovery journey, and early on in this journey, this part of ourselves may be in hiding most of the time. Because we have unknowingly pushed away from the pain we once experienced and from its impact on our lives, this part of us has been pushed into hiding. The problem is, of course, that even though this part exists outside our awareness, it has a great deal of power in our lives. In fact, because it exists outside our awareness, it has greater power than it would if we were more aware of its presence. This is the part of us that is insecure and reactive. This part of us usually believes terrible things like, I am bad, I am ugly, I am stupid, I am worthless, I deserve what I got, no one can possibly love me. Often, no matter how hard we try to earn love and value, this part of us carries a deep intractable fear that we are beyond help or hope and beyond love. Whatever happens to a child influences the child’s sense of self. If a child loses a parent to mental illness, drugs, divorce or death, the child may feel both responsible for the loss and deserving of abandonment. If a child routinely experiences verbal abuse or physical abuse, the child will feel little sense of value. If something as obscene as sexual abuse happens to a child, that child will feel obscene, or in a child’s language, ugly and dirty. In addition, children who are traumatized may suffer not only from demeaning, violating words and actions, but also from a lack of nuture, support, love and care. In fact, many kids who are abused or traumatized suffer as much or more from the neglect and the lack of love as from the trauma itself. So this wounded part of us is hurt, frightened, ashamed, wanting to hide and starving for love. The second “self” is a judgmental self. Prior to recovery and early in recovery this part of us is often “in charge” of things internally. And this part of us very much wants to remain in control. Many of us are surprised to discover, as we begin our recovery, how much this part of us has been in charge. The judgmental self is critical and rejecting of us and of others in many ways. But most especially, the judgmental part of us is rejecting of our wounded self. The judgmental part of us may see the wounded child as too needy, too vulnerable, too much of a burden, too big of a problem, not deserving of our time, an embarrassment, and even a threat. To the judgmental part of us, the wounded child is to blame for the bad things that happened and is therefore a source of terrible shame. The judgmental self within us sees the wounded child as overwhelmed with pain. 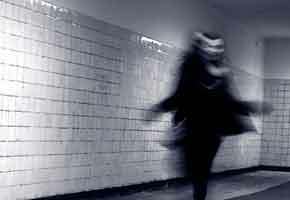 The wounded child could lose control at any minute and misbehave, and therefore is bad and must be tightly controlled. Because of all this fear and reactivity toward the wounded self, the judgmental part of us wants to silence, control and disown the wounded child. Judgment always creates separation. And in this case, because the judgment is against ourselves, the judge in us keeps us separated from ourselves. This separation is the opposite of wholeness, the opposite of healing. So when the judgmental part of ourselves is in charge it actively impedes our healing. The key to understanding this part of ourselves is that this part has been trying desperately to protect us from harm that we secretly fear we deserved. Depending on the nature of the trauma, this attempt to provide protection may have carried a feeling of life-or-death urgency. This could be true if we felt our world coming apart when parents divorced or when a parent died. It could be true if neglect was physical as well as emotional. And it could certainly be true if our lives were directly threatened. The protective stratgies that the judgmental part of us might use can range from being quiet and “good” to being angry and hostile. Whether the strategy of protection is to hide or to attack, the real drive behind it is to control ourselves and others in the hope that we can create some sense of safety. This part of us has been working hard to make life work. But its attempts inevitably make things worse. We will see that the solution to the difficulties created by the judgmental part of us is not to banish the wounded part of ourselves but to heal the fear and shame from which the judgmental part of us has been trying to protect us. The third internal self we will discuss is the observing, compassionate self. This is the kind, wise, loving part of us. The observing role this part of us plays is that of being able to notice and pay attention to what is happening with the wounded child and the judgmental self without adding more judgment or reactivity. The compassionate role this part plays is to respond with the kindness and love that our wounded child and judgmental self need in order to heal. Early in recovery, this part of us may be anemic or may even seem nonexistent. When we have survived childhood trauma of one kind or another, we are often able to experience and express understanding and compassion toward others. But it is often very difficult for us to feel understanding or compassion toward ourselves. There are several reasons for this lack of compassion toward ourselves. We may live in despair that any compassion is available to us. We may believe we don’t deserve compassion. And we may fear that if we are “soft” on ourselves we will be vulnerable to further trauma. The reality, however, is that without understanding and compassion we cannot fully heal. A vital part of our recovery is to become capable of taking in grace and compassion from God and from others and to become capable of extending grace and compassion toward ourselves. Because we begin this journey with the observing, compassionate part of us so underdeveloped, we need to begin by taking in love and grace from others. Even this may be difficult. We will probably have to be content with taking in a little bit at a time. But as we continue to be nourished by grace, we will grow this part of us so that our capacity for compassion toward ourselves is strengthened. Of course, these three internal states do not comprise the entire self. We are certainly more complex than this. But focusing on these three internal states and how they interact and even conflict with each other can give us a way of understanding our need for healing and the internal struggle we experience as we go through the processes of healing from childhood trauma. According to this model, the processes we go through in recovery from childhood trauma include (1) developing awareness of our internal states, (2) taking ownership of our experiences and of our internal states and (3) integrating our internal states so that we can experience wholeness. Each of these processes can be extremely challenging and painful. None of this can be done alone. We need support. We need God and a few others to bear this burden with us. We need to experience God’s guidance and comfort as it comes to us directly from God’s loving Spirit and as it comes to us through those God brings into our lives. Many of us will struggle with trusting God in this way. We may fear that God is like the adults who hurt us, or like the adults who did not protect us. We may fear that God is disappointed with us, has forgotten us, or is disgusted with us. Our deepest healing will be to discover that God is none of these things. God is revealed to us as “the Father of compassion and the God of all comfort,” who “daily bears our burdens.” God is eager to show us directly and personally how deeply loved and valued we each are. Our part is to risk inviting God to comfort us, to reveal love to us, and to open our minds and hearts to receive all the gifts of grace we need in order to fully heal. These three processes are not linear. They are not a simple one-two-three-and-you-are-done experience. Instead they are cyclical. We begin by asking for God’s help and the help of others so that we can start to look at what is happening in our minds and hearts and lives. We then continue to ask God’s help to acknowledge and accept what we are becoming aware of. And slowly we seek the courage and strength we need to begin to integrate the reality we are now seeing and accepting. With the continued help of God and others, we become more aware, acknowledge more, and integrate more fully. And then, again, with help, we see more, accept more and embrace more. This cycle continues until we deeply embrace our experience and ourselves and know ourselves embraced. We begin the first healing process by getting the support we need to look inside. This help might come from a therapist or a support group. It might come as well from a few other people who love us and listen to us and pray for us. But the basic truth is that we need the help of at least one other person to even begin this journey. When we embark on this healing journey, we often have little awareness of what is happening internally. We may be aware that we are anxious or depressed. We may be aware that we are exhausted from trying so hard to make life work. We may be aware that we feel lonely even when we are with others because we are perpetually detached and numb. But we are often unaware of the degree of fear and shame and resentment we carry, or of the internal trap in which we are caught. Most of us embark on this journey because whatever strategies we have been using to protect ourselves from further pain have been causing their own pain and have left us in a state of crisis. This crisis may be anything from disabling anxiety, to severe depression, to the dissolution of a close relationship, to the growing insanity of codependency or addiction. Whatever the crisis is, it is always an opportunity to begin this healing work. Awareness of the judgmental self. Perhaps the most common starting point for developing awareness is to begin to look at and listen to our judgmental self. Because this part of us is in charge, and because our wounded child is in hiding and our compassionate self may seem nonexistent, we usually begin by speaking from this place of judgment. The harshness we turn on ourselves comes out of a terrified drive to keep things under control internally. One of the most painful realities of whatever trauma we sustained was that we had little or no control over the events taking place. But because we were perceiving with the mind of a child, we believed we should have and could have been in control. As a result, we believe that we failed in some fundamental way, that we are responsible for what others were doing and that we therefore need to be to be tightly controlled or punished. Sometimes these childhood fears were reinforced by the adults in our lives who may have told us that whatever was happening was our fault and that we deserved punishment. Often the judgmental part of us takes whatever shaming words we heard about ourselves as children and uses those very same words in endless attempts to control ourselves and others. These are fears that we continue to live with as adults, often unknowingly. They are fears that have come to feel like truth to us. They feel so true that we have come to believe that all others will see us and judge us in this same way. We even have come to fear that God joins us in this judgment. Although these fears and judgments against ourselves keep us in a great deal of distress, we will not find it easy to give them up. In fact, for a long time in our recovery journey the possibility of giving up self-judgment and condemnation may feel wrong and even terrifying. Awareness of the wounded self. Awareness of the wounded part of ourselves will not come as easily as awareness of our judgmental self. Because this part of us is filled with shame and fear, and because it despairs of ever being truly loved, it has gone into hiding. This does not mean that it has no influence on our thoughts, feelings or behaviors. It has a great deal of influence. The dismissing of the trauma or its impact is another way of describing how we push away the wounded part of ourselves. Anything less than this defensiveness leaves us feeling vulnerable and exposed. Thus, to invite the wounded part of us out of hiding is to invite vulnerability, exposure and pain. An impossible task. Except for one thing. This part of us is starving for love. So, often, to our surprise, in the context of being loved and valued in therapy or in a support group or friendship, this part of us makes herself or himself known. The first “appearances” will be brief and will be met with attacks from the judgmental self. But if love and valuing are constant, this part of us will slowly come out of hiding so that we can hear and see the reality of the woundedness we carry. Awareness of the observing, compassionate self. Finally, we need to develop an awareness of our observing, compassionate self. The problem is, of course, that early in recovery we may not have much of an observing, compassionate self at all. And we may not be aware of how weak this part of us is. The observing part of us may be underdeveloped because we have spent a lifetime avoiding, denying and minimizing any painful truths about ourselves. We may have developed permanent defenses against really knowing ourselves. These defenses could include any of a number of dynamics, from being emotionally and spiritually numb, to striving to prove how good or capable we are, to working to control everything around us, to losing ourselves in addictions. In a sense, these defenses are driven by our disowned wounded self, and are held in place by the judgmental self who is desperate to maintain distance from the pain we carry. How do we develop awareness? How do we develop a deeper, growing awareness of our wounded self, our judgmental self and our compassionate self? It seems there are two primary things that we need in order to do this. We need to seek the loving help of God and of at least one other person. And we need to begin to pay attention in new ways. One activity I found helpful was to intentionally set aside some time on a regular basis to prayerfully listen to what was going on inside me. I would often begin by inviting God’s loving Spirit to provide the guidance, courage, humility and grace I needed. And I would invite God to simply show me whatever I needed to see. Then I would wait quietly. After a few minutes of quiet, I would journal whatever came to me in this time of quiet, whether it was a painful memory or a sense of God’s presence or complete silence. I would also try to stay alert to whatever else might come to me throughout the day. I would journal about whatever I sensed I was being shown, even when it was painful to do so. It can also be helpful to regularly give voice to our judmental self, our wounded self and our compassionate self. We can do this by quietly observing, and writing down, what we sense is going on with each of these parts of us. The value of such an exercise is that we begin to clarify internal dynamics and develop a greater sense of choice about what goes on inside. When we give voice to the judgmental self, we begin to hear how harsh we can be with ourselves and others, and where this harshness can lead us. When we give voice to our wounded self, we begin to finally allow this part of ourselves, which has had very little voice, to speak so that this part of us begins to be heard and seen in new ways. And as we give voice to the compassionate part of ourselves, we begin to strengthen a part of ourselves that has been virtually nonexistent. As we develop a growing awareness of each of these internal states, we do well to develop a growing awareness also of the dynamics betweeen these three parts of ourselves. We might ask ourselves from time to time some of the following questions. What happens when the judge is in charge? What happens to our wounded self? What happens to our compassionate self? And what happens to our behaviors and choices–how we treat ourselves and how we treat others–when the judge is in charge? What happens when the wounded self is in charge? What happens to the judging part of ourselves or to the compassionate part of ourselves? What happens to our behavior and our choices? What happens when the observing, compassionate self is in charge? What happens when our wounded self feels heard and loved by this part of ourselves? What happens when the judge is also heard and loved by this part of ourselves? What happens to our internal world? What happens to our external world of behaviors and interactions with others? The next process of this healing journey is about taking ownership of each of these parts of ourselves. Taking ownership moves us beyond awareness to a growing acknowledgment that the wounded child self, the harsh and controlling judgmental self, and the observing, compassionate self are truly parts of our psyche. The goal of taking ownership is to allow God’s Spirit to transform us. The compassionate part of us gains strength, the wounded part of us gains freedom, and the judgmental part of us begins to release control. All of this leads to less internal division and moves us toward integration, or wholeness. Taking ownership of our wounded self. Taking ownership of our wounded self brings to the surface the pain that this part of us carries. We find ourselves feeling ashamed, afraid, angry and reactive. As we say, “This is me” about our wounded self, we face our deepest pain without the protection of our defenses. This can feel impossible. It can feel like it will kill us. We have pushed this part of ourselves away and said “This is not me,” because of the depth of the pain that this part carries. But in doing so we have abandoned ourselves. Taking ownership of our compassionate self. The act of taking ownership of our compassionate self is the act of intentionally stepping into this part of ourselves. It is comparable to taking ownership of various underworked muscle groups by going to the gym and lifting weights. We start by doing just a few repetitions with five-pound weights and slowly build up to more repetitions and heavier weights. In much the same way, we actively choose to extend grace and compassion toward ourselves, a little at a time until this ability becomes stronger in us. Stepping into our compassionate self draws the wounded child part of us out of hiding, because this wounded child is starving for love. But this wounded child is also in a great deal of despair about love. This part of us feels unlovable. So the grace and compassion that are being offered by God, by others or by our compassionate self may feel like a trick or an impossibility. The wounded child feels frightened, ashamed and exposed and wants to go back into hiding. This is part of the battle we are up against as we continue to take ownership of our compassionate self. For some time the compassion stirs up difficult reactions inside. But ultimately it is compassion that allows us to fully heal. Taking ownership of our judgmental self. Taking ownership of our judgmental self may begin with a growing awareness of how much we believe we need this part of ourselves–how much we fear we may lose control without it and how much we believe we deserve harsh treatment. The accusations that we hurl against ourselves have come to feel like truth. So the thought of giving them up or even modifying them feels like we are being asked to lie. We may have been telling ourselves in one form or another that we are unlovable and without value. And now God and others and even our compassionate self are telling us that this is not true. No matter what happened and no matter what we have done, we are loved and valued. It can be helpful in the midst of this conflict to realize that our judgments against ourselves are not honest or humble, but are rather a form of pride. They are designed to protect us from further harm, by rejecting our need for love. But of course they create ongoing harm for us and for those in our lives. We may believe that our self-judgments hurt only us, but the truth is that these judgments directly impact our relationships. One of the many advantages of taking full ownership of this part of us is that it deters us from continuing to project our self-judgments onto others. We often unknowingly assume that others are judging us in the ways that we are judging ourselves, and then we react to them for judging us. We won’t recognize, until we own this part of ourselves, that we are doing this to ourselves. As we stop judging ourselves, other people’s judgments of us–real or perceived–begin to lose their power. Another advantage to others when we begin to own our judgmental self is that as this part of us is changed by God’s love, we are far less likely to judge not only ourselves, but others. To the extent that we judge ourselves, we also judge others. And to the extent that we receive and extend grace toward ourselves, we are able to extend grace toward others. Extending grace toward ourselves does not mean that we minimize our responsibility for the ways in which we hurt others. Paradoxically, it is as we take in grace and let go of self-judgment and condemnation that we are finally able to see the truth about our impact on others. In our unhealed state we often assume global “blame” for everything, which in effect blinds us to the places where we are truly hurtful. This global blame keeps us self-focused and reactive and thus unavailable to see our faults and to make amends to those we harm. As we say, “This is me” about our judgmental self, we can begin to ask God to show us the specifics of who and how and when we hurt others, so that with God’s help we can make amends and begin to change. And we can ask God to release us from guilt that is not guilt at all but anxiety about wanting to control others or to meet their sometimes impossible expectations of us. How do we take ownership? How do we go about this difficult process of owning these parts of ourselves? How do we come to a place where we can fully acknowledge, “This is me” about our compassionate self, our judgmental self and our wounded self? I think the place to start is by letting our compassionate self take the lead. Even though this part of us may not be very strong yet, we can regularly ask God to fill us with grace and to help us step into our observing, compassionate self. For me, the outward action of lighting a candle, followed by some time in quiet prayer and meditation, has been helpful. The simple act of lighting a candle does several things at once. First, it is an action I intentionally make from the compassionate part of myself. This part of me lights a candle as an act of prayer and blessing for the wounded part of me and the judgmental part of me. As I light the candle I simply say, “The light of Christ.” In doing this, I acknowledge my need for Christ’s healing presence and invite God’s Spirit to do what I cannot do. I then sit quietly (and without demand or expectation) with my wounded self and my judgmental self, aware of the light of Christ with me. When I lead workshops on this subject, I light a candle for the participants and simply state, “The light of Christ.” I point out that the light of the candle, like the light of Christ, is gentle and generous. I then invite participants to bring their compassionate self, their judgmental self and their wounded self, one at at time, into this gentle light. I then invite them, as they are able, to be aware of what it might be like to say, “This is me” about each of these parts of themselves. I remind them not to force anything, but simply to observe what happens and offer themselves to God’s loving care. The third process of this cyclical journey is integration. The process of integration involves bringing parts that have been separated together into a whole. Integration happens as our compassionate self embraces our wounded self, as our wounded self takes in love from God, from others and from ourselves, and as our judgmental self releases its defensive pride and its desperate attempts to control and surrenders to God’s loving care. For a time, the embrace of our wounded self by our compassionate self will open deep caverns of grief in the wounded child. We will again need to see the road sign that reminds us, “This way to freedom.” We weep because we feel the pain we have pushed away for so long. We feel the losses–with all their accompanying anguish, shame, despair and fear–very directly. And we weep because we are able to feel the love we have longed for. We are finally able to release our grief because we are being comforted in God’s loving arms, in the arms of others who love us, and even in our own compassionate arms. This grief comes with a promise of blessing and healing. “Blessed are those who mourn,” Jesus said, “for they will be comforted” (Matthew 5:4). As the wounded part of us is held and comforted, the judgmental part of us gives up its vigil. The part of us that has been trying to keep us safe by attempting to control our thoughts, feelings and circumstances can surrender. Surrender by the judgmental part of us is not a giving-up rooted in despair. Nor is it a kind of giving-into the overwhelming feelings of hurt. It is a surrender to love. It is the relief of releasing ourselves to God’s loving will and care for us. We can let go of being in charge. We can let go of relying on ourselves. We can allow God to help us, guide us, provide for us, heal us, love us. As a result, we can rest. What we are likely to experience as our compassionate self gains strength through the processes of integration is that we are no longer at war with ourselves, but at peace. And we will find that our hearts are no longer so guarded, but are open to receive more and more of the love and grace God continually pours out on us. How do we integrate? How can we experience this wholeness? How can we experience this in-pouring of God’s healing love and grace? The answer is that we can repeatedly take God’s love, our love and the love of others to the wounded and judgmental parts of ourselves. There are several ways we can actively engage in this process. I will describe a few that I have found to be helpful. One thing we can do is to write (or say) prayers for the wounded and judgmental parts of ourselves. A similar activity is to write letters from our compassionate self to our wounded and judgmental selves, allowing these parts of us to write back. Either of these activities offers us ways of opening ourselves up to experience further integration and healing. Perhaps one of the most powerful actions we can take is to open our hearts and minds to the healing power of Scripture. However, the most familiar ways of approaching Scripture may not be as deeply helpful as we need. For centuries people have meditated on biblical texts in ways that allow the truth of God’s love and grace to flow into the deepest parts of the heart and mind. There are many ways to approach this kind of meditation. Perhaps the most basic approach is to begin by inviting God to speak to us from a given text. We can then read the text, allowing ourselves to enter it in ways that involve our senses. For example, we might read a narrative text like the one in Mark 10:13-16, the story of Jesus calling the children to himself. We might begin by inviting God’s Spirit to guide us and then read the text slowly three times–each time putting ourselves in the story as a different character. We might begin by putting ourselves in the story as one of the disciples who tries to keep the children away from Jesus. To do this it is helpful to “see” and “hear” the scene to whatever degree is possible, and to let ourselves experience what the disciples might have experienced. We can then read the text again, but this time put ourselves in the story as one of the children–again allowing ourselves to experience what it might be like for the child part of us to be invited by Jesus to receive his blessing. And then finally, we can read the text a third time and put ourselves in the story as someone who is sitting next to Jesus–welcoming and embracing the children. The goal is not to force anything, but to simply observe what happens. After these readings and meditations we might want to write about our experience and share it with at least one other person. This meditation can be repeated using the same text several times. It can also be repeated using a variety of texts. The core wound of childhood trauma is a wound to the child’s developing sense of self. As we have seen, the child comes to believe terrible things about himself or herself. Most commonly, traumatized children who are not assisted to heal as children, will carry with them into adulthood beliefs that they are unlovable and without intrinsic value. These beliefs, whether conscious or unconscious, form the basis of the person’s identity. Letting go of these beliefs, therefore, may feel like annihilation. It may feel like letting go of all there is of oneself. But as we experience the kind of healing love we have been discussing, we begin to experience ourselves in new ways. We begin to experience ourselves as loved and valued. No matter what has been done to us, those events do not tell us who we are. We can let go of our despair and shame because they do not define us. They are not who we are. Who are we? We are children welcomed by Jesus into his loving arms. In those arms of love we are made whole. The impact of whatever trauma we have suffered is undone. We are healed. We are released. We are free to love and free to be loved. For more information about Juanita Ryan visit juanitaryan.com.